Remodeling is a good way to raise the property value on a house and also to make any space more livable and unique. You’ll want to forge a solid strategy, however, before you go knocking down any walls. Here are a few things that you should consider before getting started. Budget, for the sake of your wallet, you’ll want to keep your vision loose in the beginning. What you think looks good and what you can afford might not match perfectly, so don’t hammer anything in stone. If you keep the concept rough, it’ll be easier to make compromises as you go. Kitchen renovation costs can range between $10k to as much as $80k, not including labor. It may be a good idea to break the whole project down into manageable portions and tackle things a bit at a time over an extended period. Prioritize what you can afford at the outset and work from there, (do you need to add space? Is the counter big enough? Do you require additional lights?) figure out what needs remodeling right away, and go from there. Don’t make the mistake of thinking you need to do the whole kitchen at once. Once you’ve got a rough idea of the budget figured out, start gathering up inspiration for what the new kitchen will look like, you can do this any number of ways. Pinterest, for instance, is an excellent way to flesh out ideas, and it doesn’t entail creating a physical, tangible collection of photos, fabrics, and textures. Alternatively, you can hunt down images of kitchens online that inspire you and compile them into a folder on your device. Find out if the renovation requires a permit. Some improvements will need permission from the city depending on the size and scope of the changes. If you are doing major electrical work, knocking down walls, or changing the floor plans of the house in any major way, you’ll need to get permission to do so from the city first. If you hire a licensed contractor to help tackle your project, he or she should let you know if they think you need one. Speaking of contractors, get a contractor! If this is your first time remodeling, you probably don’t want to try to DIY this. Too often we make plans and realize too late that we simply don’t have time, or are suddenly inundated with other obligations, if that happens during a renovation, you will end up with sections of your kitchen being rendered useless for weeks or months at a time. Hiring qualified professionals to do the job for you cuts-down on the risk of you getting sidetracked by life. If you are only remodeling cabinets, you’ll probably be okay handling things on your own, but if it’s something more complex involves plumbing, gas, electricity, or knocking down walls, it’s a good idea to hire a licensed contractor. Get estimates from them for labor costs (labor costs are usually less than the overall price of parts and materials,) and ideas on how best to utilize the kitchen space. Remember, these people do this for a living, so if there is a flaw in your initial layout/vision, they will spot it and help fix it before it becomes a problem. Lastly, make sure you have the following things figured out before the project begins. Your time management. What hours will the project be taking place in, sometimes things run over, will your job interfere with the project, will you be home to let the contractors in, will you have to cancel certain days because of work? Be prepared for the unexpected. Halfway into the project, it might turn out that you need some part or other and will have to factor it into the budget, that’s okay, that’s why we kept our original vision flexible, to compensate for incidentals. Making compromises. The bigger a renovation is, the more likely it is that you will have to make some compromises to your initial design for one reason or another. Approach this logically and listen to what the professionals tell you. If they think that it’s best to avoid doing something, or that something simply isn’t possible, then take their advice and prevent a headache down the road. Don’t stress over the mess. 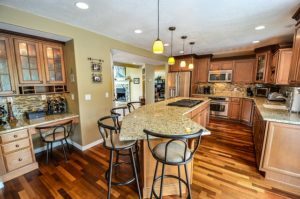 If you are living in the house while the renovations are happening, it might seem stressful to see your kitchen in a prolonged state of remodeling, but keep in mind that it is only temporary and that when the renovation is over, it will look better than ever.